Today the country honors those veterans who died while serving their country. Memorial Day is not be confused with Veterans Day which celebrates all veterans. Tradition has it that the flag of the United States is raised briskly to the top of the staff and then solemnly lowered to the half-staff position, where it remains only until noon. It is then raised to full-staff for the remainer of the day. For many Americans, the central event is attending one of the thousands of parades held on Memorial Day in large and small cities all over the country. Between the parades and flag raisings, other traditions associated with the day have sprung up over the years. One of the longest-standing traditions is the running of the Indianapolis 500, an auto race which has been held in conjunction with Memorial Day since 1911. Most Americans however celebrate the day with bar-b-ques, or they hit the road searching for adventure or visiting family and friends. Marketers use the holiday as an excuse to promote Memorial Day sales. Memorial Day also marks the start of summer. 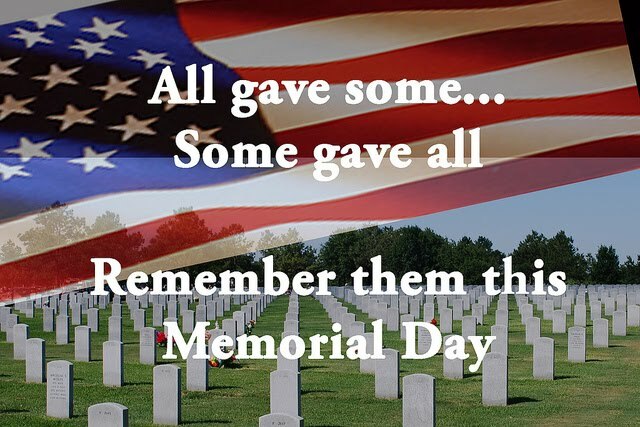 Whatever you do be safe and remember what this holiday is really all about - honoring veterans who gave their all while serving this great country.